Progress on direct election of governors? A bill on reforming gubernatorial elections has been submitted to the State Duma, although action is not expected until later in the year. On Jan. 16, President Dmitry Medvedev submitted a bill to the State Duma that may restore direct gubernatorial elections in Russia as soon as in May 2012. Both independent candidates and registered party members may take part in the elections. According to the bill, parties will be allowed to negotiate their candidates on a voluntary basis. More reforms may be coming, including the possibility of electoral blocs, said Vladimir Pligin, head of the Duma’s Committee on Constitutional Legislation. The political meaning of this initiative is to combine Putin’s “presidential filter” idea with Medvedev’s democratization, explained Viktor Sheinis, a co-author of the Russian Constitution and a member of the Yabloko party’s Political Committee. However, this mixture appears ineffective in legal terms. “The Russian President already has too many rights and powers that are not written into the Constitution,” Sheinis said. “The return of direct gubernatorial elections should not be mistaken for the introduction of free and fair gubernatorial elections,” agreed Rostislav Turovsky, Vice President of the Center for Political Technologies. According to Turovsky, no formal procedures are required for the Kremlin to control the nomination of candidates, as happened during Vladimir Putin’s first presidential term, before direct gubernatorial elections were abolished. The bill may be altered before it is passed, with “consultations” becoming more binding for the parties. According to Pligin, this provision could be strengthened. Potential amendments could also affect the registration of the president’s comments, which is not mandatory for the parties now. All seven registered political parties will have the right to freely nominate their gubernatorial candidates. But according to the amendments Medvedev proposed in December 2011, registration requirements will be significantly relaxed. If many new parties emerge in Russia, the issue of establishing electoral coalitions, or blocs, could be raised, Pligin said. The bill contains a number of restrictions concerning age (a candidate must be over 30) and term duration (no more than five years). At the same time, there are no restrictions on the number of gubernatorial terms one person can hold. “During every transition from one system to another, a question arises as to what term should be regarded as the first and what as the second. As of now, we have not made any restrictions in order to avoid a complete mess as to who holds which term,” said Brycheva. She added that the bill is unlikely to be passed before May. After that, regional lawmakers will have two months to bring their legislation in line with the new bill. Meanwhile, some governors, including the Moscow Region’s Boris Gromov, will see their powers expire in May and June. 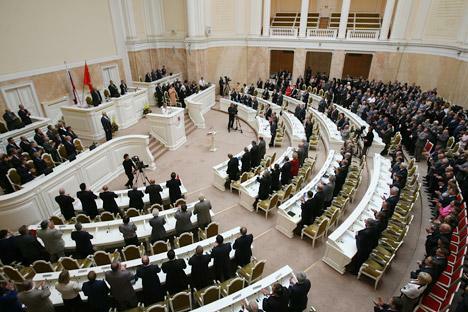 Regional parliaments may not have time to enact new electoral laws by that time. According to sources, Kremlin officials have not yet decided what to do in such cases, and they are not ruling out the possibility that a special presidential decree may be needed to regulate the electoral process.